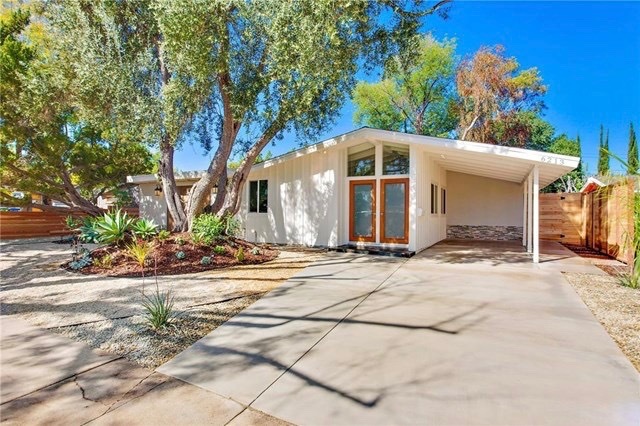 Beautifully remodeled 4 bedrooms, 2.5 baths, "Corbin Palms" neighborhood home, designed by Architects Palmer and Krisel. This home features open -beam ceilings, wide expanses of new double glaze windows and doors, new engineered hardwood and porcelain floors. New kitchen with custom cabinets, huge island with sitting area, Quartz counters, backslash and new Sumsung stainless steel appliances. Living room with wood burning fireplace. Remodeled bathrooms with granite and marble counters, and custom vanities. New Cool Roof, new water heater, new copper pipes, new paint inside and out. New landscaping in front yard, sprinklers in the backyard and new seder fence. Bonus room has 2 separate entrances and could be used as home office or kids play room. This home has large lot and there is also room for pool.